SANTA CRUZ, CA--Efforts by UC Santa Cruz to build more on-campus housing for faculty and staff got a significant boost when ground was broken March 5 on the first phase of the Ranch View Terrace project. Phase One of the project, near the base of campus, allows for the construction of 45 three- and four-bedroom homes. Following site-preparation work, construction on the homes will begin this fall. The first units are likely to be available for occupancy in fall 2008. "Ranch View Terrace is not only critical to our efforts to recruit and retain faculty and staff, it is responsive to community requests that we develop more housing on campus," said Acting Chancellor George Blumenthal. When completed, the first phase of Ranch View Terrace will increase the stock of for-sale housing on campus by more than 30 percent. UC Santa Cruz now offers 143 units of for-sale housing, predominantly condominiums and townhouses. In addition, 51 units at Laureate Court, across High Street from campus, are rented to faculty and staff members. The Ranch View Terrace homes are designed to provide an increased inventory of available units for the many UC Santa Cruz faculty and staff members now on long waiting lists for on-campus for-sale housing. The 16 three-bedroom units will range from approximately 1,750 to 1,900 square feet, and the 29 four-bedroom units from approximately 2,000 to 2,100 square feet. Prices range from $479,000 to $655,000, not including buyer-selected upgrades. "We have a lot of people who really want to buy at Ranch View Terrace," said Housing manager Steve Houser. "More than 200 people are on the waiting list for the new homes, including 31 people now living in other campus housing." A shift of some on-campus homeowners to Ranch View Terrace would also create vacancies in other campus housing, a goal of the Ranch View project. The timing of the second phase of Ranch View Terrace, with an additional 39 homes, will depend on buyers' response to the first phase, Houser said. "If we have strong sales, the campus would likely opt to promptly proceed with Phase Two." The development's on-campus location near the main campus entrance offers employees a convenient commute to work, with easy access to walking trails and bike paths to the core of the campus, as well as campus shuttle bus and city bus service. 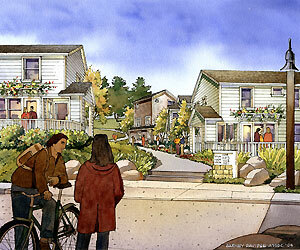 Built in clusters of six to eight homes, the units will face pedestrian pathways linking to common areas. "Comfortwise" standards for energy and water conservation will be incorporated into the construction, and buyers may include additional energy-efficient options such as photovoltaic solar panels. As with other campus for-sale projects, employee purchasers will lease the land from the University of California, and lease provisions will ensure that the homes remain at below-market value over time. Note to reporters: A high-resolution artist's rendering of Ranch View Terrace is available here. This press release is also available electronically at http://press.ucsc.edu/.